If you are working on UNIX / Linux environment, you should become comfortable in the Vim editor. If you think the Vim editor is not user friendly, or intuitive to learn quickly and become an expert — you are not alone. 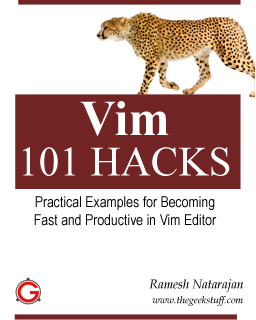 This book contains 101 practical examples that will help both newbies and intermediate Vim users to become an expert. 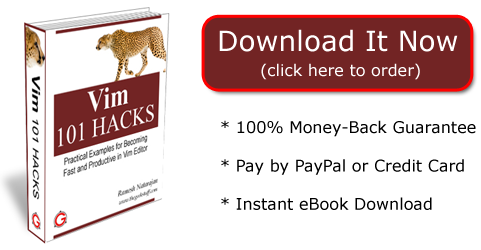 Each hack provided in this eBook is very crisp and easy to understand. The practical examples will show you exactly how to use a particular Vim feature. This book contains 15 chapters with a total of 167 pages. Chapter 1 contains Vim basics for those who are new to the editor. Chapter 2 – 14 contains a total of 101 Hacks with practical examples. Chapter 15 contains additional bonus hacks. This chapter will be constantly updated with more bonus hacks on all future editions. For the regular readers of the blog, I’m giving a huge 40% discount, which is available only for the first 100 buyers. Once you purchase the ebook, all future editions of the book is free. I’m so confident that this book will improve your Vim editor skills , I’m giving 100% money-back guarantee. If you are not satisfied with the book, let me know and I’ll refund your money.